I have two more National Parks to talk about, both from my recent trip. The first is Black Canyon of the Gunnison, and the second is Mesa Verde. Both in Colorado, both parks we visited on the way home from Pike's Peak. Because, heck, if you're going to drive all the way from California to Colorado, you might as well get a good sampling of what Colorado has to offer. Here are a couple of small samples of these parks. Also, because there are only just so many vacation photo blogs I want to write (and even that may be more than you want to read) I'll throw in a couple of miscellaneous shots that I really felt were worth sharing. They're not specific park destinations. Just spectacular things we saw along the way. Like rays of morning sun over the Colorado River. Or the (confusingly named) Arkansas River in Colorado crowned with lenticular clouds. 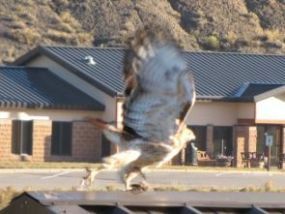 Or a hawk taking flight at Rifle Gap State Park. Or the sun rising over the Hopi Nation in Arizona. Rest up from national park photo viewing, because the Panorama Trail at Yosemite is only a couple of weeks away. Weather permitting. Don't we live in a beautiful world?